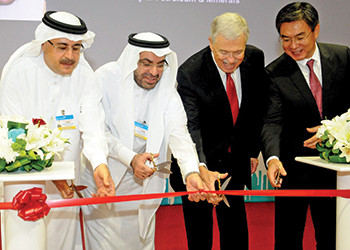 Huawei, the global information and communications technology (ICT) solutions provider, launched in early September a new Oil & Gas Joint Innovation Centre (JIC) in Saudi Arabia in collaboration with Saudi Aramco and the King Fahad University of Petroleum and Minerals (KFUPM). According to the Chinese multinational the JIC, located in Dhahran Techno Valley (DTV) Innovation Centre in the kingdom’s Eastern Province, will be "committed to enabling ICT technologies for the oil and gas industry, leveraging on Huawei technologies and global partners’ expertise to meet customers’ specific requirements." The company is also co-operating at JIC with leading partners such as Honeywell, Schlumberger, GE, Yokogawa, SAP, and other companies to develop solutions, it adds. The JIC inauguration was attended by senior executives from Huawei, Saudi Aramco, KFUPM, and various partner companies, as well experts from other leading technical, engineering and energy service firms, and the significance of the centre to Saudi Arabia’s oil and gas industry, as well as being part of an evolving and dynamic DTV innovation ecosystem was underscored in a series of presentations. "We have 15 years of local experience and have become the leading ICT infrastructure provider," Yan Lida, President of Huawei’s Enterprise Business Group, noted as he emphasised the Middle East’s strategic position in Huawei’s global footprint. "By understanding the massive transformation happening among different industry customers, Huawei has launched Business Driven ICT Infrastructure (BDII) as a guiding principle of our Enterprise Business in order to address these challenges. "Business is the source of power to determine ICT needs and will ultimately drive ICT infrastructure changes. The key to BDII lies in ‘Ecosystem-based Innovation’, which is reflected in three ways: customers’ business innovations, partners’ industrial application innovations, and Huawei’s ICT infrastructure innovations. Huawei will focus on ICT infrastructure that includes cloud computing, pipe, and devices," he continued. The Dhahran JIC, one of almost 30 such centres Huawei operates globally with its partners, will focus on Digital & Intelligent Oil Fields, Digital Pipelines, Intelligent Refineries, High Performance Computing, Big Data, Mobility, Safety & Security, Cloud Computing, and Energy Management. Huawei’s offering addresses the fact that oil and gas companies’ performance improvements depend on new ways to manage data as well as information and operational technology. Huawei says it is one of a select few companies which can provide the entire solution, from data capture to processing, and this will now be available in Saudi Arabia. The JIC will also, says Huawei, play a key role in knowledge sharing of broad technical industry areas through structured training and knowledge transfer programs that can effectively add value to Saudi Aramco, KFUPM, and other oil and gas companies, as well as partners. Within Saudi Arabia, Huawei has supported similar knowledge-sharing initiatives such as its Annual Seeds for the Future education program, which offers select students the opportunity each year to develop practical skills that will prepare them for a career in the ICT industry. Speaking at the inauguration, Abdulaziz Abdulkarim, Saudi Aramco’s vice president of Information Technology, described the JIC as "another icon in Dhahran Techno Valley". "We are embarking on a new partnership which speaks of innovation in every aspect imagined. The DTV is a fertile environment for the exchange of technology and business ideas, crossing diverse industrial divides to deliver solutions that address current and future challenges. With the addition of Huawei a new dimension is being added to further diversify the expertise available in the DTV. I believe this should advance technology collaboration and integrate communication and computing capabilities into product development by the DTV partners. Saudi Aramco is committed to supporting innovation that helps find and produce hydrocarbons more cost effectively while maximising our recovery ratio." The JIC launch is the latest move in Saudi Arabia for Huawei, which already provides Saudi Aramco with a unified telephone conference system solution, which includes two sets of pre-warning and conference systems and two sets of disaster recovery devices (the M2000). On a global level, Huawei has experienced rapid growth since its establishment in 1987, and in 2014 reported total revenues of $46.5 billion. Proving its commitment to innovation, the company invested a significant $6.6 billion on research and development (R&D) last year (up almost 30 per cent year-on-year), and runs 16 R&D centres worldwide. Approximately 45 per cent of the company’s total 170,000 employees are engaged in R&D. This year Huawei ranked 41 in Thomson Reuters’ Top 100 global innovators, and in the energy field Huawei serves 12 of the world’s top 20 petroleum companies. Huawei’s presence at DTV adds to the critical mass of innovators based at DTV, the first phase of which is complete. Ground work is now starting on the second development phase. "Huawei is the first ICT company in DTV and they are deeply connected to what we do in oil and gas," Dr Khaled S Al Sultan, Rector and CEO of KFUPM, told visitors at the inauguration. "I have no doubt that this is just the start for Huawei. We have the right ecosystem for the work to be done."